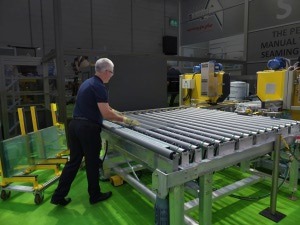 Using the proven technology of their high speed fully automatic arrissing lines, so successful throughout the world for two decades, ASHTON INDUSTRIAL have developed an ingenious new configuration, a layout that offers customers the perfect entry into automatic arrissing. SEAMMAXX-PRO SOLO™ is constructed from the same individual stations as its bigger brother, the SEAMMAXX-PRO™ fully automatic high speed lines that can process up to 7 random size lites a minute. Instead of two fully automatic arrissing stations linked by transfer conveyors, the SOLO concept uses just one fully automatic station and special software that allows it to process all 4 sides of any glass. It can be specified for glass sizes as big as 5m x 2.8m and handles minimum dimensions as small as 150mm. The output capacity depending on glass size, averages around 2 lites a minute. “Main benefits include consistent high quality edging, massively reduced risk of fingerprints or scratches on coated glass surfaces, single person operation and reduced operator fatigue. In an ideal layout, it can be fed directly from the breakout table, so there is no loading operative as such. And best of all, it can be upgraded later to a full-blown fully automatic high performance SEAMMAXX-PRO™ without any of the components becoming redundant. 1. Glass is loaded from a rack or direct from breakout, on to castor balls, and positioned against a side datum of free running wheels. A foot pedal START signal is given. 2. The castors retract and the glass moves forward on driven belts: the moving arrisser automatically sets itself within seconds to the glass size. 3. 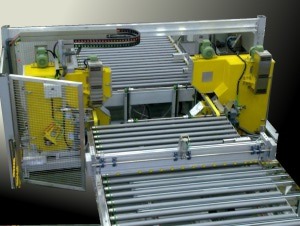 The glass passes through the arrissing station and both short edges are simultaneously processed.It exits on to a dual direction conveyor, which then reverses the glass at high speed back to the loading table, where the castors lift to allow the operator to turn the glass 90 degrees and press the START signal again. 4. 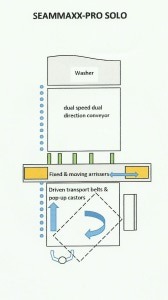 The moving arrisser re-sets itself at high speed to the second glass dimension, and the long glass edges are arrissed as it passes through, this time continuing straight in to the washing machine, while the operator is already loading the next glass. See ASHTON machinery in action by clicking the VIDEO LIBRARY button on the homepage.